Renowned artist Roberto Gutiérrez has the silhouettes of the 6th Street Bridge etched into his soul. Some might even say he is in love with the historic cement and steel structure that has joined Boyle Heights and downtown Los Angeles for more than three quarters of a century. Born just over a decade after the bridge was built in 1932, the veteran artist, known for his tender, stylized Eastside cityscapes, was saddened when he heard that it would be torn down and replaced. The new viaduct, a sleek, futuristic behemoth based on a winning design selected as part of an international competition, is a harbinger. Alongside the recently opened Broad Museum, it is indicative of a now obvious top-down commitment to restoring and re-invigorating DTLA as part of an overall plan. Great cities, as noted in much of the public information and in statements issued around the bridge replacement project, are typified by dynamic city centers. Vibrant urban hubs invite suburbanites back to the city’s core and make it a destination for both tourists and residents. More importantly, however, the new bridge will be built to withstand any seismic ravages looming imperceptibly before us. The existing bridge, according city officials, planners and engineers, is plagued by a rare cement defect that, over time, has been characterized by the spread of small fissures which have significantly reduced its structural stability. It is, they say, no longer earthquake proof and therefore, unsafe. The iconic structure, laments Gutiérrez, will go the way of many other landmarks and monuments that speckle his memory like the splashes of paint or ink on the countless canvases, sheets of paper, wood panels and napkins he has touched in a prolific 50-plus year career as a fine artist. 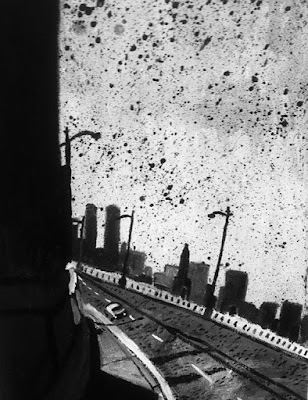 But unlike those landmarks which connect him to a lifetime in the City of Angels, a city which suffers from a short-lived collective memory, the 6th Street Viaduct lives on for him and those who know him in a formal record, an epic, extended portrait comprised of more than 30 paintings, watercolors and drawings inspired by the bridge and created expressly for an exhibition held earlier this year at Ave. 50 Studio in Highland Park. “As long as I can remember, it’s been there,” says Gutiérrez over coffee at La Monarca Bakery in South Pasadena near the climate controlled storage facility where he keeps much of his work. The iconic structure figures heavily in his recollections as he navigates an intensely personal narrative and underscores his attachment to the iconic causeway. For Gutierrez, the bridge was and remains a many-splendored metaphor, a multi-faceted allegory. “For me it represented so many things,” says Gutiérrez, the youngest in family of nine. “We were poor, and we moved around a lot.” Sometimes earning money as a shoe shine boy on the streets of downtown LA, he often went unsupervised, he says, following a wanderlust that manifested in grade school. Most of his childhood was spent in clapboard houses scattered from Highland Park to Boyle Heights with an indelible stint in what is now considered Chinatown. The one constant architectural symbol that accompanied his cross-town forays, besides city hall, was the bridge. It was, he recalls, a consistent accessory along the route his family followed in pursuit of affordable and adequate housing, punctuating the daily exodus from Boyle Heights—where he finished high school—to the rest of Los Angeles for work, for occasional trips to Grand Central Market or—much less frequently—for those magical visits to one of the many vaunted movie palaces along Broadway or Main. “It was just this marvelous thing to behold,” he says. “Crossing it was sometimes almost like traveling to another land.” According to online sources, the demolition crews will be carting away some 48,000 cubic yards of concrete, 1,245 tons of steel used in girders and structural supports and about 4,200 tons of iron rebar reinforcement over which the cement was poured. The cement used in the bridge construction was produced in a factory built on-site. And the bridge itself has been featured in scores of films, television shows and music videos as a both a naturally picturesque set and or dark, foreboding location. “Growing up it was just one of those things that always stood out. Going over it was almost like a right of passage,” Gutiérrez recounts, who eventually enlisted in the Marine Corp and volunteered for duty in Vietnam. “I was something I felt like I needed to do,” he continues. It was also a way to reduce the pressure on his parent s, who had shouldered the responsibility for the care and feeding of so many for so long, he confesses. His experience in the service and the realities of Vietnam were difficult and took their toll, he confesses. A nascent artist and thinker, his temperament was not well suited to life in the military and wartime culture. “After I got out of the service, I came home to a city that was changing, or maybe it was me who had changed,” he remarks. His artwork, he says, was more informed by his need to preserve a sense of place than by the growing Chicano movement activism which influenced the artwork being made by many of his contemporaries. His earlier work was thus largely defined by a singular aesthetic that merged abstraction with a figurative expressionism that remained somehow reminiscent of impressionism. More personal than public, it documents the gritty, humble patchwork confluence of streets , intersections, residential dwellings and improvised commercial spaces in the vivid Eastside of his youth. “I was looking for something inside, and, in a way, maybe I was also trying to recover some of my own innocence,” he says. Murals, which, by nature, function as both public art and as alternative educational resources, explains Gutiérrez, went well beyond his personal attempts to depict the neighborhoods and the public spaces he was familiar with honestly and without intentional nostalgia or a political agenda. In 2010, Gutierrez visited Paris to see work by some of the artists he admired, among them Claude Monet and Chaim Soutine. He also spent time in working-class parts of the city, areas not recommended on the lists of usual tourist destinations. “I saw some of the same scenes I remembered from East LA and Boyle Heights, some of the same sadness and loneliness,” he explains. He returned to create a series of works in black and white, based on his impressions of a Paris that had more in common with his childhood haunts than he could ever have imagined. The collection was ultimately compiled in a South Pasadena gallery show that was highlighted by stark, moody depictions of Parisian streets filled with palpable tension and arcane darkness. Many of the paintings hinted quietly at somber, Gothic melancholy or the dank possibility of danger waiting just out of sight. That exhibition, says Gutiérrez, led to him to an introspective and deeply personal exploration of the city he once knew now filtered by a soft-pull focus on the disquieting shadows and bleak silences lurking on downtown street corners after sunset, under the glow of moonlight or dim streetlamps and in alleys between forgotten brick buildings. From those ruminations on the L.A. captured in the Raymond Chandler stories of Philip Marlowe and in films such as Double Indemnity, shot inside La Golondrina Café at Olvera Street and starring Barbara Stanwyck, Gutiérrez developed his next definitive body of work. The black and white paintings and watercolors he produced in response to his tour through Paris became the basis for an exhibition called L.A. Noir. There, Gutiérrez sought to redeem the gray concrete, the weather-beaten steel and the smog-stained brick walls that were emblematic of the neglected architectural relics lingering ghost-like, across a literal and mythical landscape. Elegy to the 6th St. Bridge, a follow up to L.A. Noir, could be described, grants Gutiérrez, as a distillation,the reductive essence of his noir fascination. It paid homage to the bridge as a cultural signifier and a physical passageway across the concrete-lined L.A. River. It stretched from the office towers and hidden hallways of power and privilege to the rough-hewn neighborhoods that shaped and colored his youth. The fact that a snarl of freeway interchanges looms over and dissects the largely Mexican-American community of Boyle Heights is a testament to the contrasting powerlessness of the humble, hard-working folk who populate the crowded, unseen interiors alluded to in much of his oeuvre from the last decade. That city planners and contractors colluded to arbitrarily impose the coil of freeway junctures just east of the river and near the bridge, a project that displaced thousands of long-time residents, original stakeholders who were not asked for input on policies or the decision making process that would affect their lives profoundly. It is that latent truth which gives the paintings, watercolors and drawings that comprise his paean to the bridge so much of their underlying strength. According to the ArtShare L.A. website, the exhibition was co-curated by Tanner Blackman, a City of L.A. planner and Dale Youngman, a downtown curator and arts consultant. It may be possible, he concedes, that the exhibition coordinators and the 30 artists invited to participate were unaware of his work or his prior exhibition honoring the bridge. “But it does kind of beg the question, because I know we sent a press release to the Times well before we opened,” he affirms.